Being invited to a baby shower is always exciting. Someone you care about is bringing a new life into the world, and you get to celebrate with them! Coming up with a baby gift that will thrill the mom-to-be without repeating the same thing everyone else is getting, however, can be a real challenge! Find a gift that will be unique and truly appreciated by doing a little clever shopping. 1. Check out the baby line at Think Geek. If the mom-to-be has traditionally geeky interests, there’s sure to be something in the Think Geek line that will bring a smile to her face. Choose a onesie that reflects her interests, look for a diaper bag that she’ll love carrying, or pick out a unique baby blanket that will be used for years rather than being discarded before the baby is two. 2. For the naturally-minded mom-to-be, Cotton Babies has a baby shower gift that is sure to appeal. From cloth diapers to natural baby wash, natural toys that will be great for baby’s development to amber teething necklaces and bracelets to help with teething pain as baby gets older, you’re sure to find something will appeal to any mama who wants to make more natural choices for her baby. 3. Want to add a personal touch to baby’s gift? Whether you’re picking up something for a first baby, who will certainly need to be spoiled rotten, or a later child, who will need a few things to call uniquely their own, Pottery Barn Kids offers a fantastic selection of personalized baby gifts. You can add baby’s name to a blanket that fits with their nursery theme, choose baby’s first rocking animal, or find a snuggly outfit that you know the mom-to-be will adore. 4. Turn to Thirty-One Gifts to seek out the mom-to-be’s perfect diaper bag. Diaper bags see more use and abuse than almost any other baby item. The new mother will carry hers everywhere for years, from those early newborn days to later toddler years, so select a bag that you know she’ll love and rest assured that it will stand the test of all those hours of use. 5. Turn to Etsy for a unique, personal gift that will be sure to be appreciated. You can choose a handcrafted item that’s already been made or have one custom made specifically for the new arrival to ensure that your gift will be appreciated for a long time. 6. Check out Uncommon Goods for a unique baby gift unlike anything else you’ll find at the shower. If you know the mom-to-be well, you’ll be able to find a gift that will perfectly match her tastes–probably something she didn’t even know she wanted. 7. Make sure baby can be carried in style! Many of today’s moms are foregoing the stroller in favor of cuddling baby close whenever they go. Even if she prefers a stroller when she’s out of the house, the new mom will be sure to have occasions when she needs to cuddle her baby close while still using her hands. Visit Tula Baby Carriers for a gift that’s sure to see a lot of love. 8. Wherever the mom-to-be is registered! Sure, you might want to choose that elusive “perfect” gift, especially if you prefer to go totally unique, but the odds are good that the mom-to-be has already done a great job of choosing the presents she’d most like to see. Shop from her registry, and think about choosing the things that are often overlooked: rash cream, breastfeeding supplies, and a baby first aid kit might not be the hits of the party, but they will be the items that are most appreciated in those rushed days when baby first arrives. Shopping for baby gifts can be a lot of fun, especially if you’re able to add a whimsical touch and a little customization. 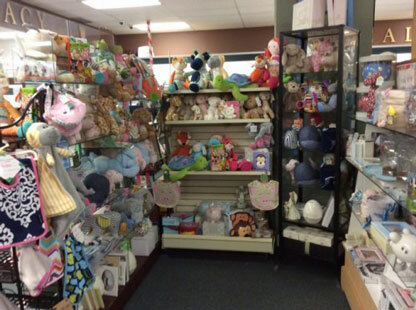 Choose a unique baby item or seek out a tried and true product that will be sure to see lots of use once baby arrives. There are plenty to choose from!